Have you always wanted to live as the dolphins live? They embody joy and are exuberantly playful. They glide effortlessly through the water and live surrounded by their pod – their family and friends, in what we refer to as Unity/Community. 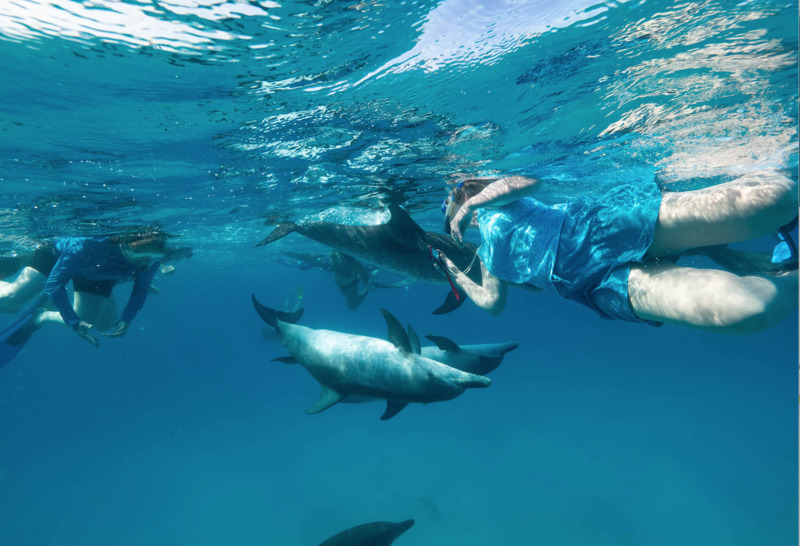 Join Linda Johns, Animal Communicator and Healing Practitioner; and Dolphin Messenger, Whale Wisdom Expert and Dolphin Energy Healer, Anne Gordon de Barrigón, to connect and swim with wild dolphins in the turquoise waters of Bimini. We will stay in a water front hotel for five nights. 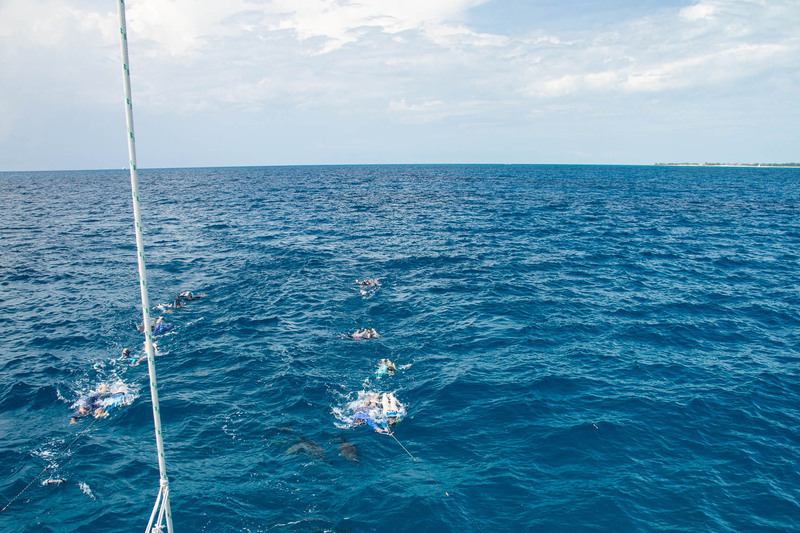 We will go out each day on a spacious and comfortable catamaran sailboat to swim and play with the Dolphins. 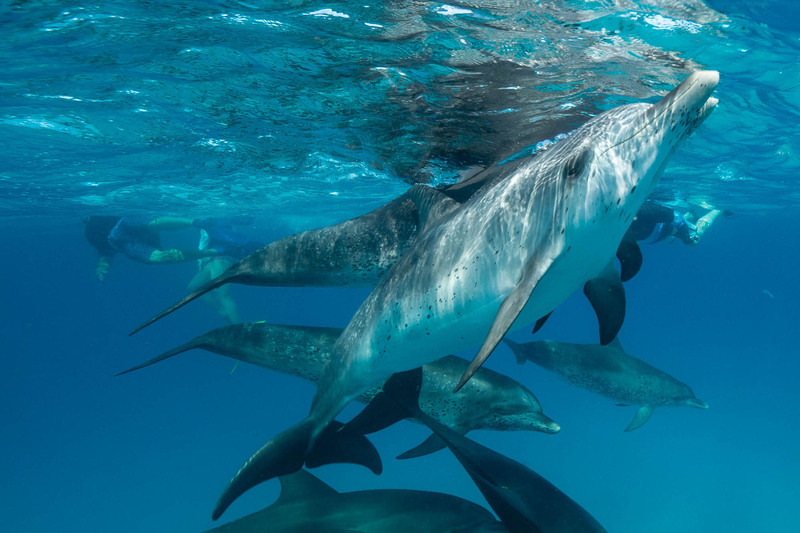 The Atlantic Spotted Dolphins around Bimini are world famous for their friendly interactions with people. We may also meet Bottlenose dolphins, snorkel coral reefs, visit the road to Atlantis and the Healing Hole on this trip. On this trip we will meet and swim with the generous and friendly dolphins of Bimini, who love to interact with curious humans. 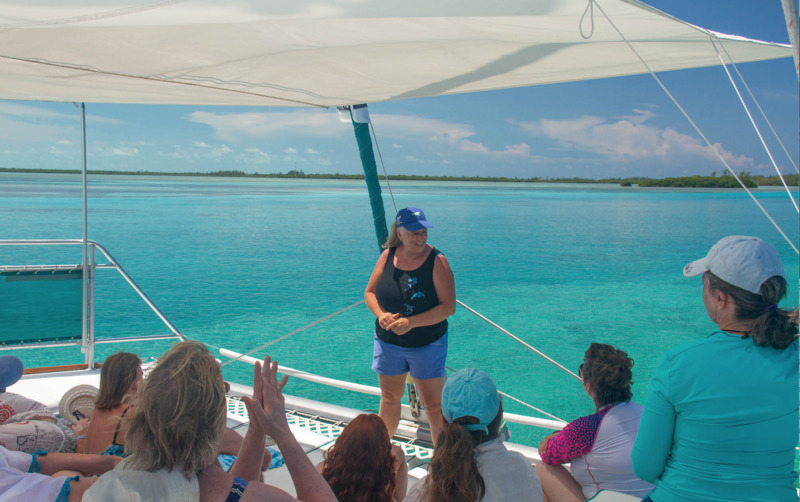 Anne will teach you how to live the Dolphin Way with what she has learned in her years of observing and swimming with dolphins. You will learn how to be more joyful in your daily life, even in the face of difficulties. You will learn how to incorporate more play into your life and the benefits that you and all those around you will experience. You will learn how to go with the flow, especially when confronted with challenges. 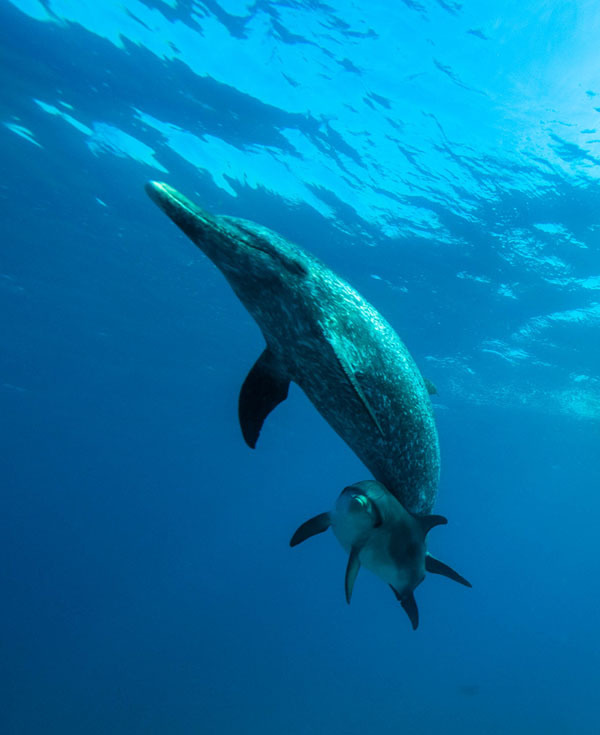 When the dolphins find rough waters, they do not resist or hide, they play even harder, using the force of the waves to propel them higher and faster to reach the calm waters. You will learn techniques to easily surf through any challenge life has to offer. Anne and Linda and the Dolphins will share how to live and heal the Dolphin Way. The healing transformation begins the first day on the boat where the beautiful turquoise water and the nature elements all give permission for each of us to breathe deeply and move out of the busy mind and simply drop into just being, fully present, mindful and aware of what we are energetically communicating to the dolphins and each other. You will learn how to be more joyful in your daily life, even in the face of difficulties. You will learn how to incorporate more play into your life and the benefits that you and all those around you will experience. You will learn how to go with the flow, especially when confronted with challenges. When the dolphins find rough waters, they do not resist or hide. They play even harder using the force of the waves to propel them higher and faster to reach the calm waters. You will learn techniques to easily surf through any challenge life has to offer. 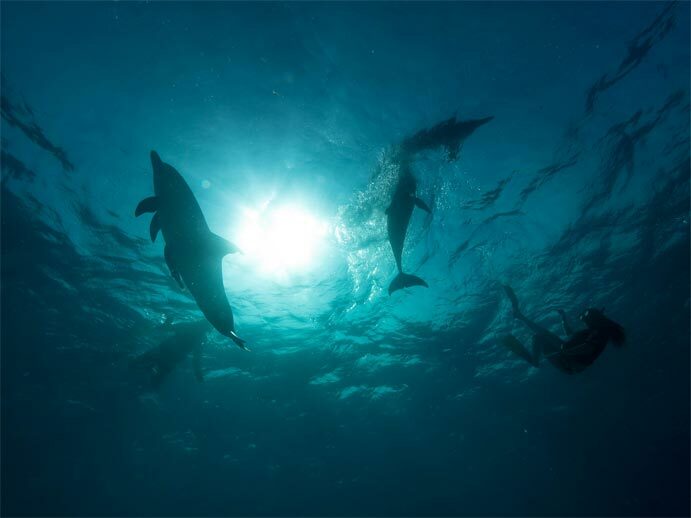 Anne and Linda will share messages from the dolphins, teach communication skills, healing meditations and introduce you to your own dolphin spirit guide who will accompany you even after the trip. 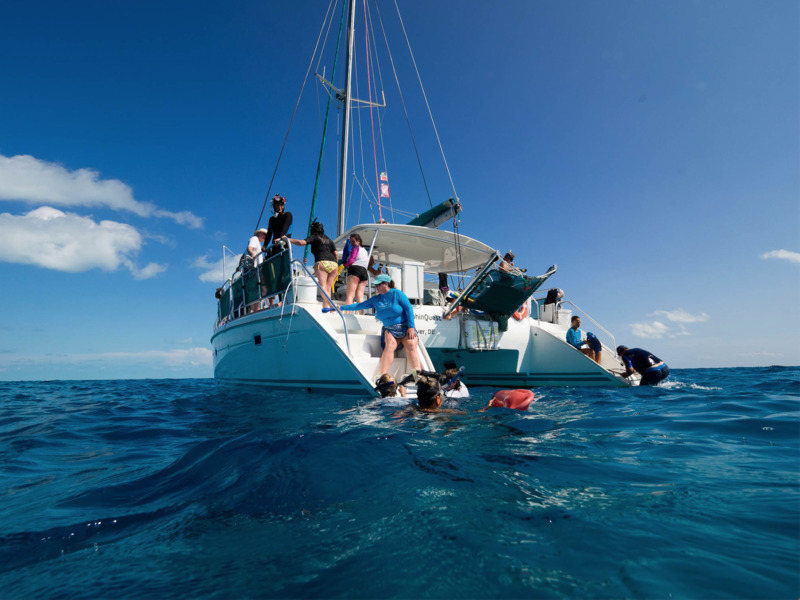 You will learn these life changing dolphin life skills and more on this transformational trip with the wild dolphins of Bimini. 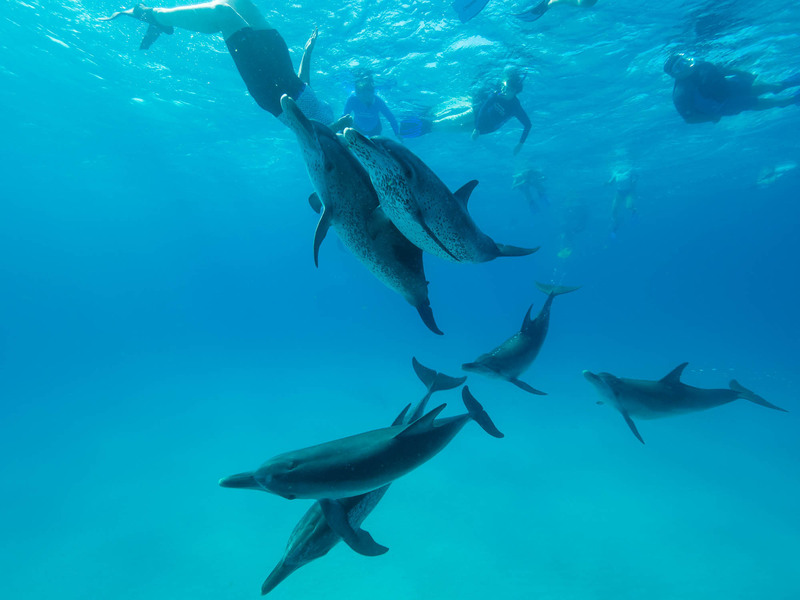 The Dolphins are waiting to play-- are you ready to smile from ear to ear and have your heart open with more love and joy than you could ever imagine? Come play with us. 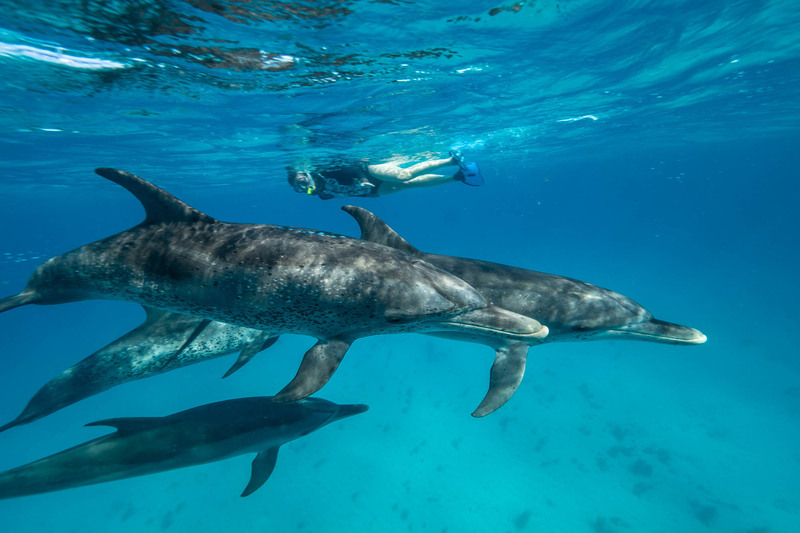 The Dolphins of Bimini have been swimming with people for over 20 years. They love to interact with humans who are ready to open their hearts to them. They often come racing to find the boat and interact with the eager people. Part of their life's purpose is to bring joy to people and to help raise their vibration. The very best way for them to do their work is for you to be in the water with them. Respectful in Water Encounters is how we will approach the dolphins in their watery home. We will observe them in their natural environment as they observe and engage us to play with them and mimic our movements. Don't be surprised if they read your thoughts and answer your questions through their actions and telepathic communication. 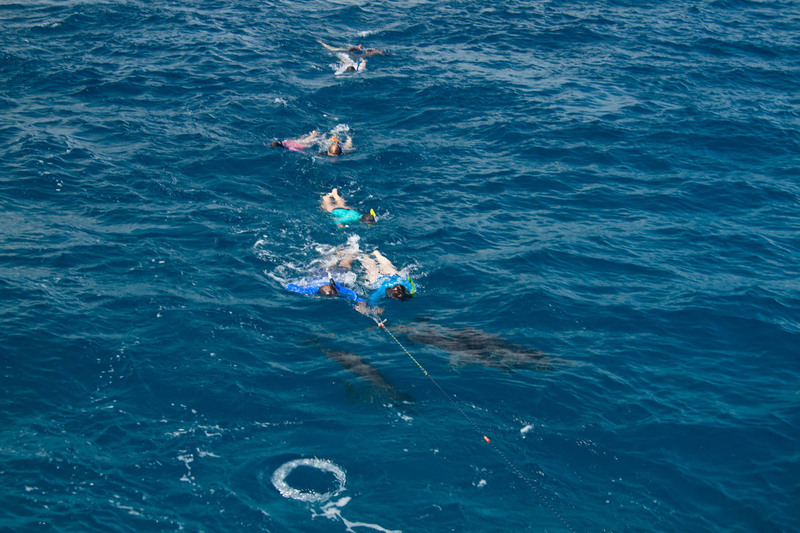 Five days of boat trips to swim with the dolphins! 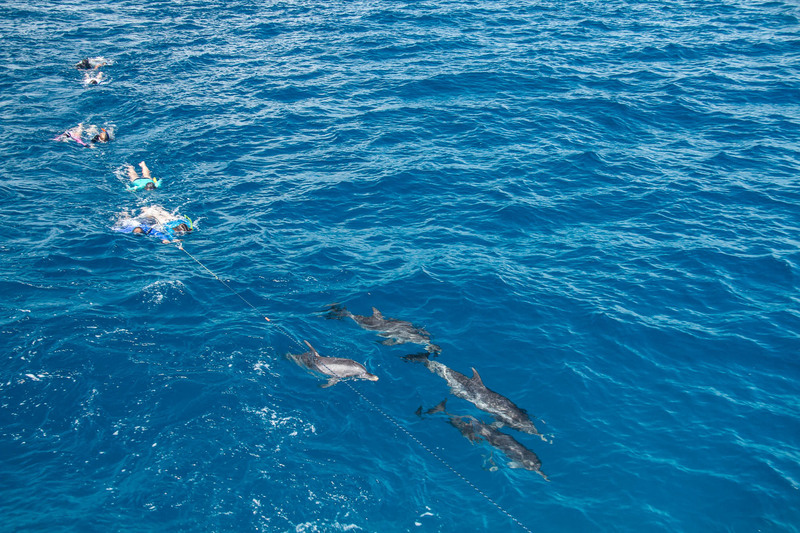 We will go out each day to meet and swim with the friendly Atlantic Spotted and Bottlenose dolphins that have been interacting with people for over 20 years. We can snorkel the famed Road to Atlantis that is right off the island. Plus we can visit beautiful coral reefs to snorkel with colorful tropical fish, rays, eels, even some curious sharks! Visit the 'Healing Hole' hidden in the mangroves and reputed to be Ponce de Leon's Fountain of Youth! 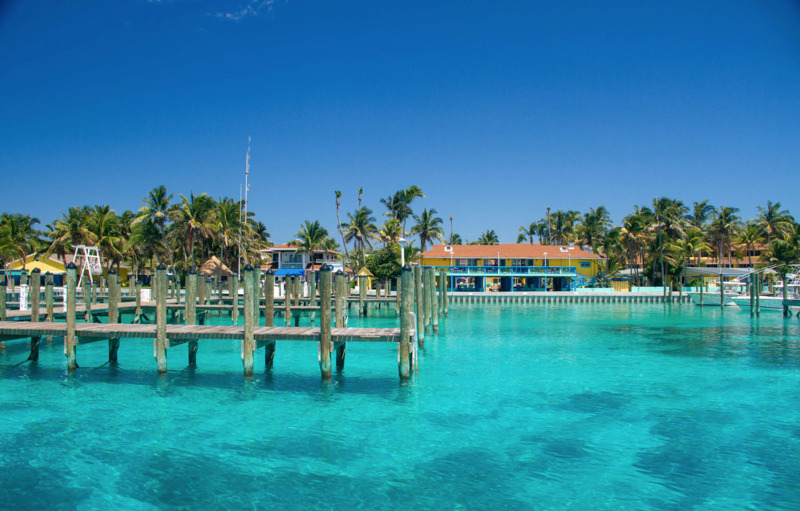 Explore the tiny island of Bimini and meet the friendly locals, experience their culture and laid back attitude. Dolphins swim eye to eye with you. We will stay in a waterfront hotel, where you will be just steps from our boat to take us to see the dolphins each day. You can walk to anywhere on the island, including beautiful beaches and the cute little town. The amazing staff at the hotel offer morning yoga classes. They love the dolphins as much as you do and are focused on you having the best experience of your life. They take care of every detail. It is a place to make friends with other like­minded souls and sincere, heartfelt crew, in what quickly becomes a ‘human pod’. Where you can belong again. 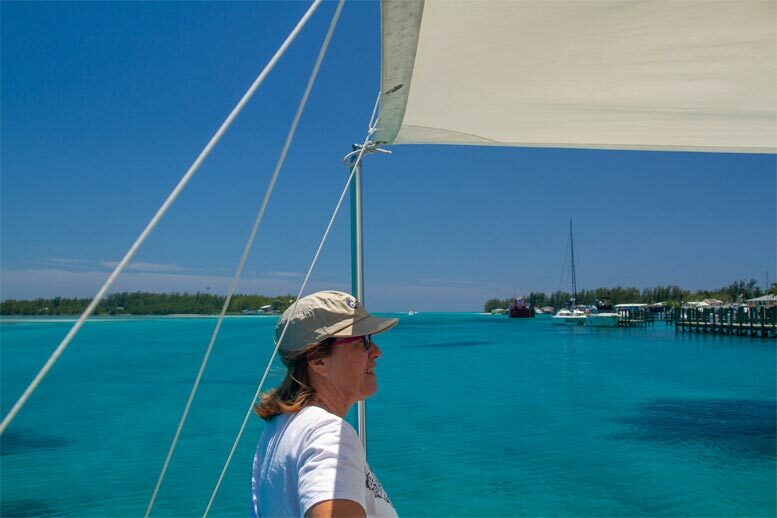 A relaxing mix of sailing open seas, dolphin swims, healthy delicious food (organic when possible) a laid-­back Retreat Centre for chilling out and enjoying the program of the week. Designed to re-­connect you with your own body, so you can connect with the dolphins when they come to greet you. 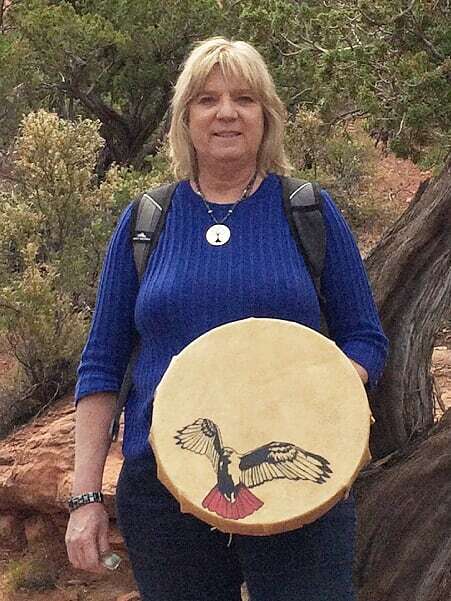 Linda Johns, Animal Communicator and Healing Practitioner, has worked in the field of alternative healing for over 30 years and is the founder of "Journey to Healing". Her life's passion is to be a bridge, linking animals and people into higher awareness, clarity and healing by using her natural intuitive abilities, clairvoyant insights and compassion. 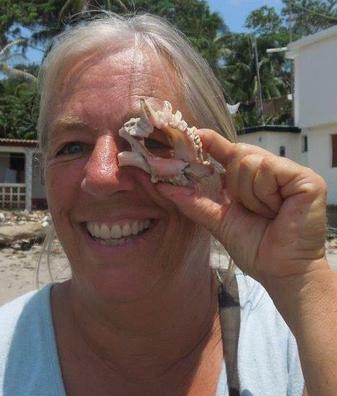 Linda's personal sessions have helped animals and their "people" all over the world. Since 1998 she has been teaching classes in Animal Communication, Intuitive Development and Personal Growth. Linda is also a Reiki Master/Teacher, PSYCH-KTM, E.F.T., Soul Memory Discovery, Arcturian Practitioner and Quantum Coach. Anne Gordon de Barrigón ​is one of your hosts for this magical bucket list experience. Anne is an experienced Humpback Whale watching and dolphin snorkel guide in Panama, as well as a Dolphin Messenger, Whale Wisdom Expert and Certified Dolphin Energy Healer. She is also a trained biologist and studied animal behavior and is expert at observing and interpreting the behavior of the dolphins. She will eagerly share with you her insights, knowledge and wisdom she has learned from the dolphins whales in her years with them. Anne will lead guided meditations to meet your very own dolphin spirit guide as well as Dolphin Energy Healing sessions for the group. Boat trips (5 days out, weather permitting). Most meals (but see what’s not included below). Guided meditations, communications from the dolphins and whales and group whale and dolphin energy healings. Shuttle transfer from the Ft. Lauderdale hotel to the airport on the Monday morning. Airport transfers on the island upon arrival on Monday and upon departure on Saturday when travelling with the group. Drinking water and hot beverages. 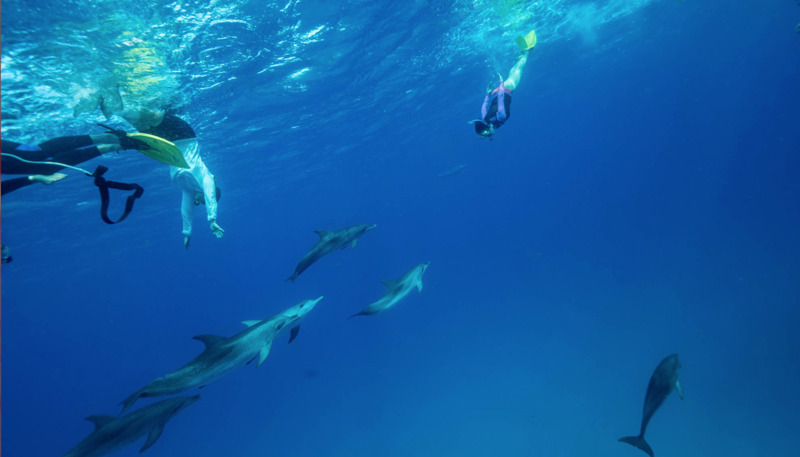 Have you always dreamed of swimming with wild Dolphins? Now is the time to live your dream! Price based on Double Occupancy. Single rate is $390 additional. Waterfront view upgrade rooms for $250 extra; limited availability. This trip will fill up fast. Book now to confirm your spot. Confirm your space now with a non-refundable deposit or pay in full. Click the button to pay for your trip. © 2008, Journey to Healing, All Rights Reserved.